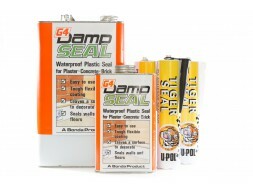 A range of sealants including Tiger Seal Polyurethane Sealant. G4 Damp Sealer is a moisture cured polyurethane coating. Providing a highly durable non-pe..
A one pack polyurethane sealer to seal and protect concrete floors and walls against:common chemical..
A one-pack, moisture curing urethane primer used to create a strong waterproof bond p..
Tiger Seal is a fast curing polyurethane adhesive sealant for bonding a wide range of..